Greetings Vault Hunters! 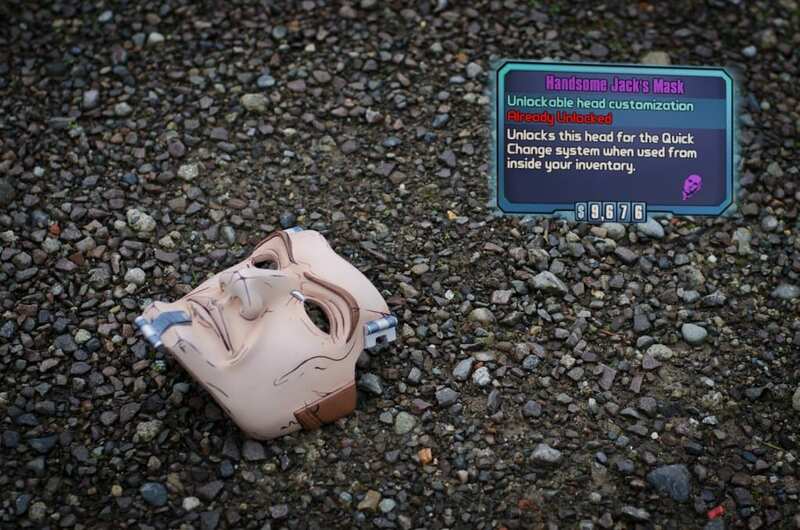 I had the good fortune of being commissioned to build a prop replica mask of this wonderful hero from Borderlands 2! 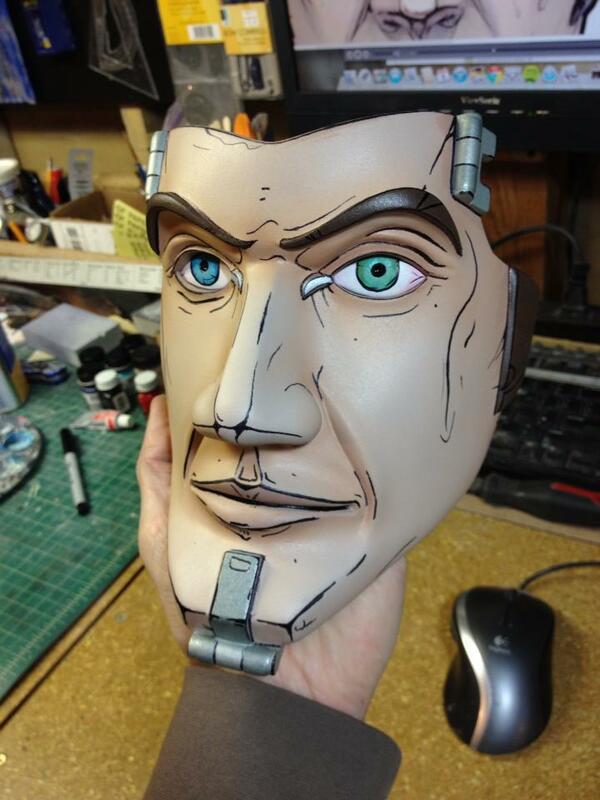 Handsome Jack! 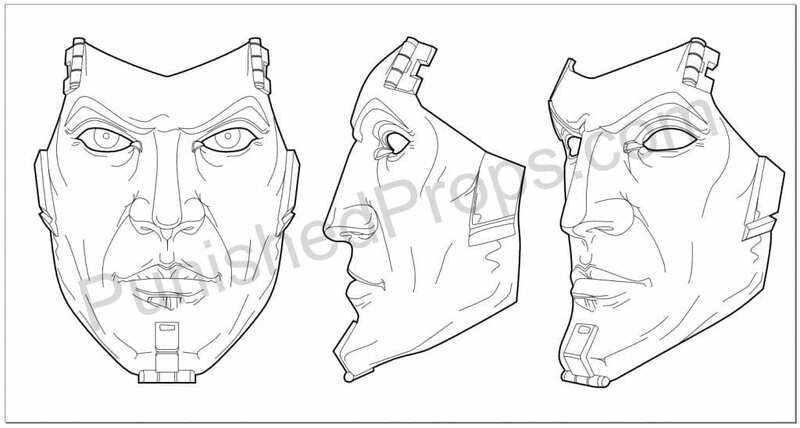 I took my references straight from the in-game model and a 2D mask image that Gearbox provided as a cut-out, flat mask. As is my traditional style, I took several orthographic views and drew up nice, concise vectors. I had ideas for making more than one copy of this guy, so I planned accordingly. 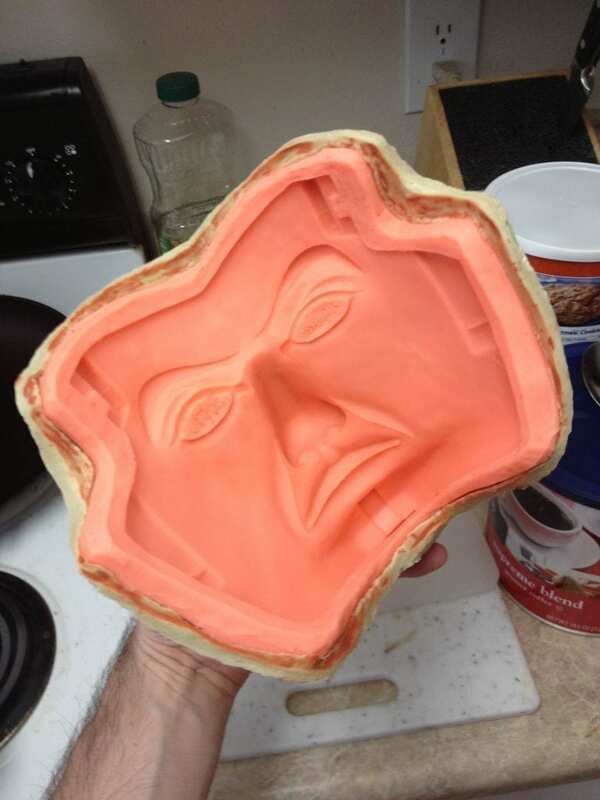 The aim was to create a master that I could make a mold from. 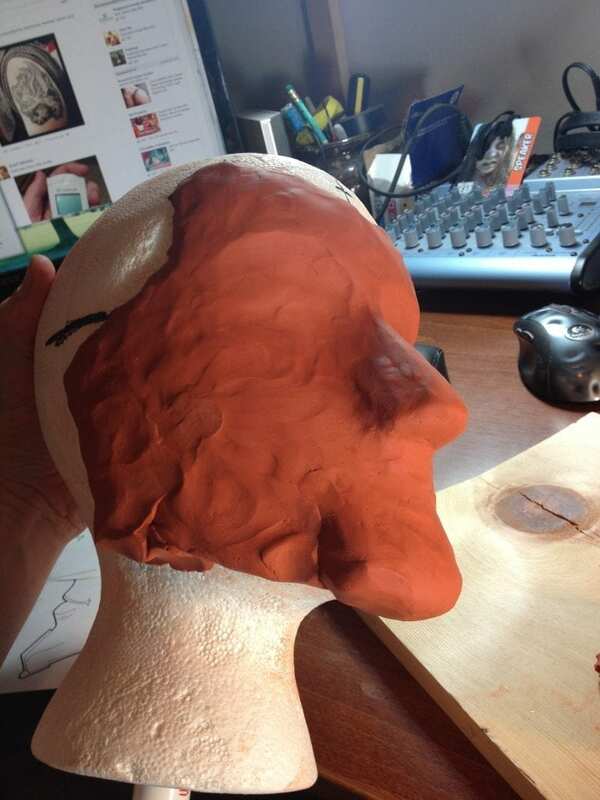 I sculpted the face out of modeling clay on top of a foam mannequin head. The modeling clay works best when it’s nice and warm, so I kept it in a box with a desk lamp pointed at it. 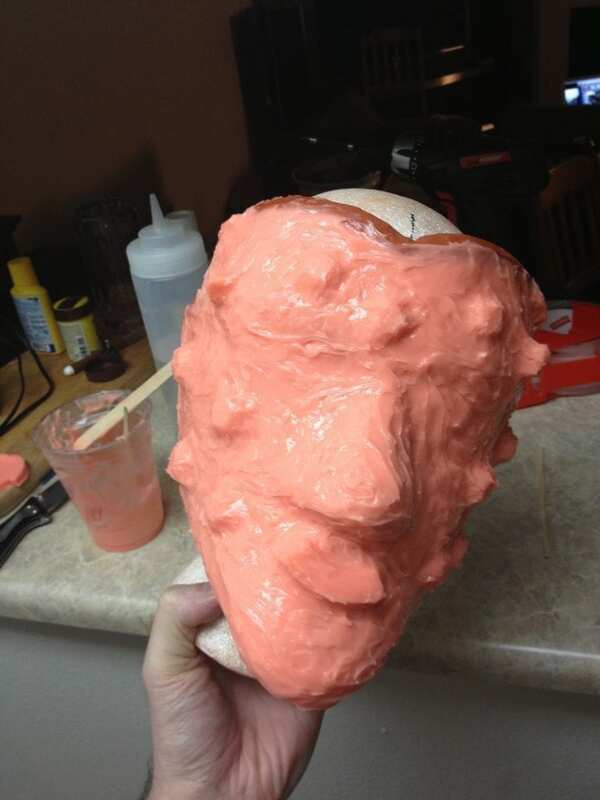 Then I took large hunks of it and slapped it onto the foam head to get the general shape of the mask. 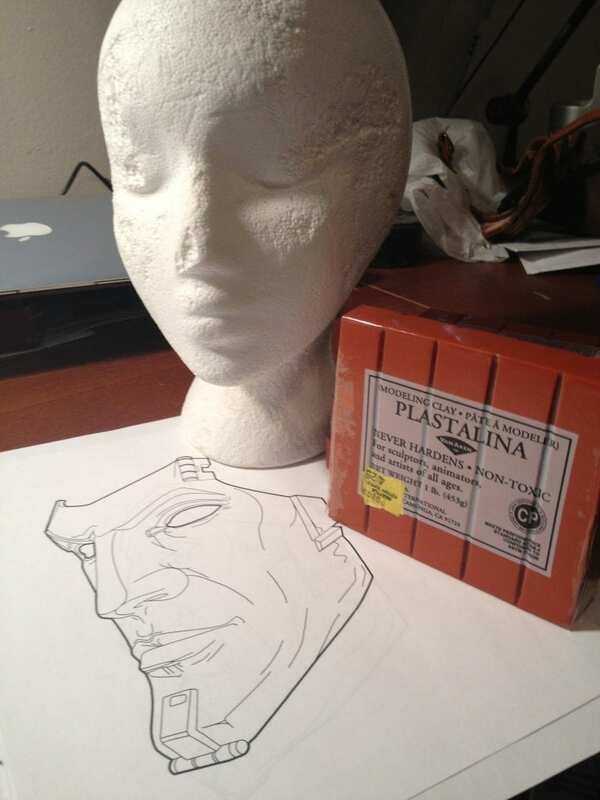 I had to dig deep into my high school art class memories to get a feel for modeling with clay again. This was definitely a test of my patience. 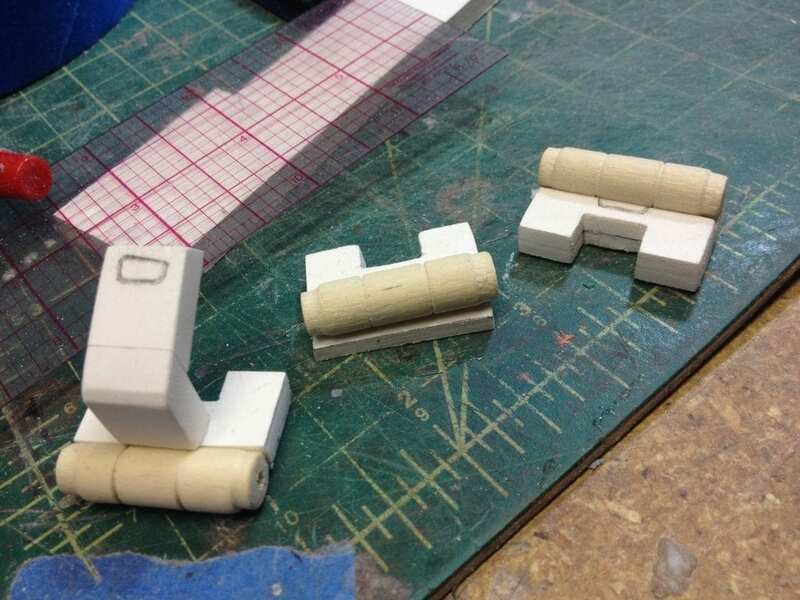 Also, I didn’t have any clay modeling tools, so I made some. 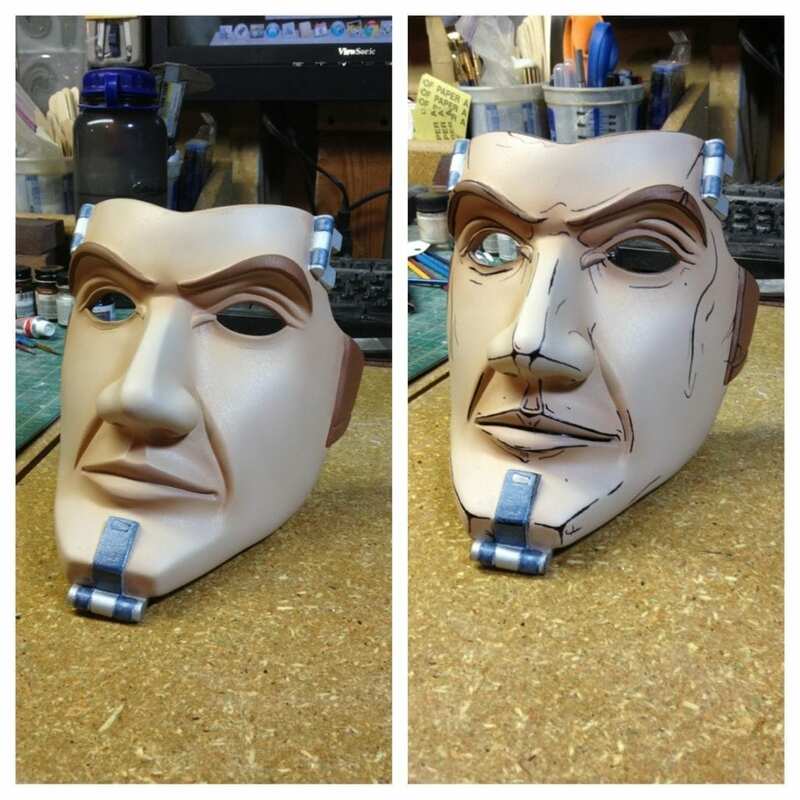 I crafted the hardware bits of the mask out of plastic and dowels. This was way easier than trying to get these hard geometric shapes out of clay. 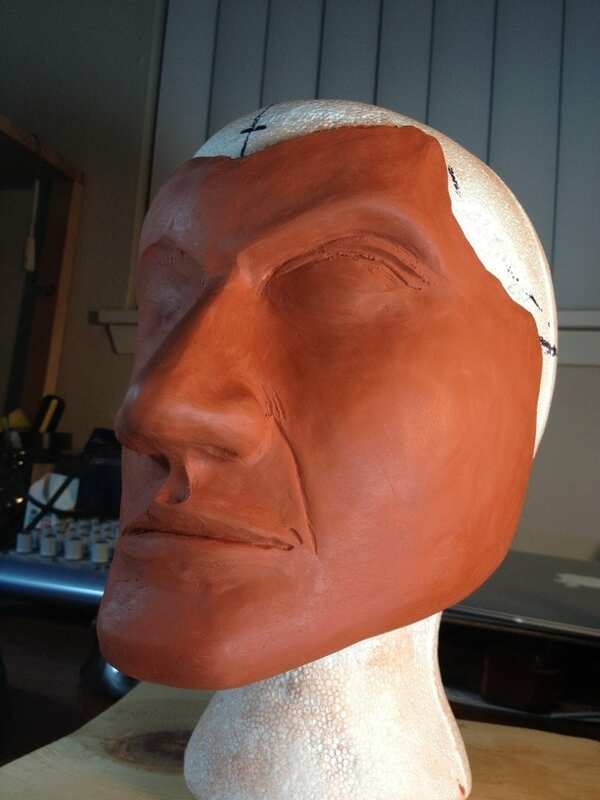 Once these pieces were finished, they were embedded straight into the clay face. 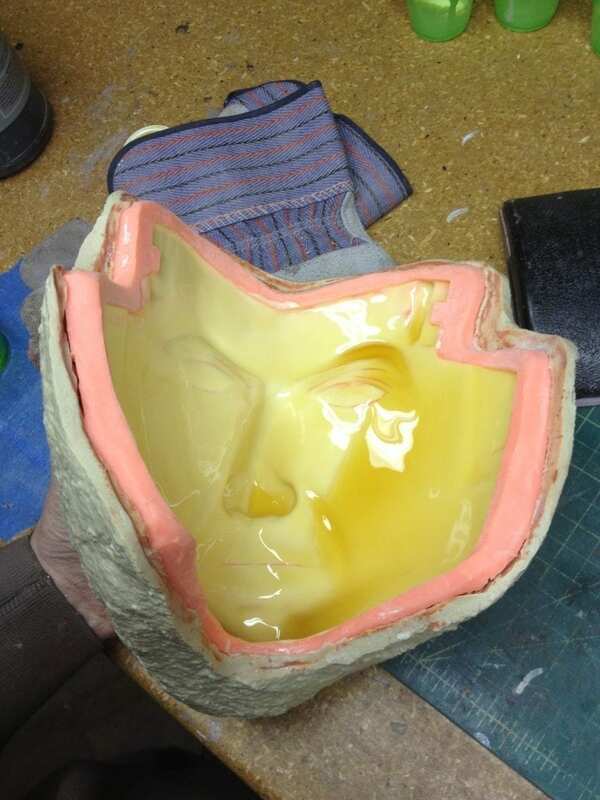 With the sculpting finished, it was time for this guy to go under some silicone. I used Smooth-On’s Rebound 25. He got 3-4 layers of silicone. Half way through I added some registration keys for the mold jacket. 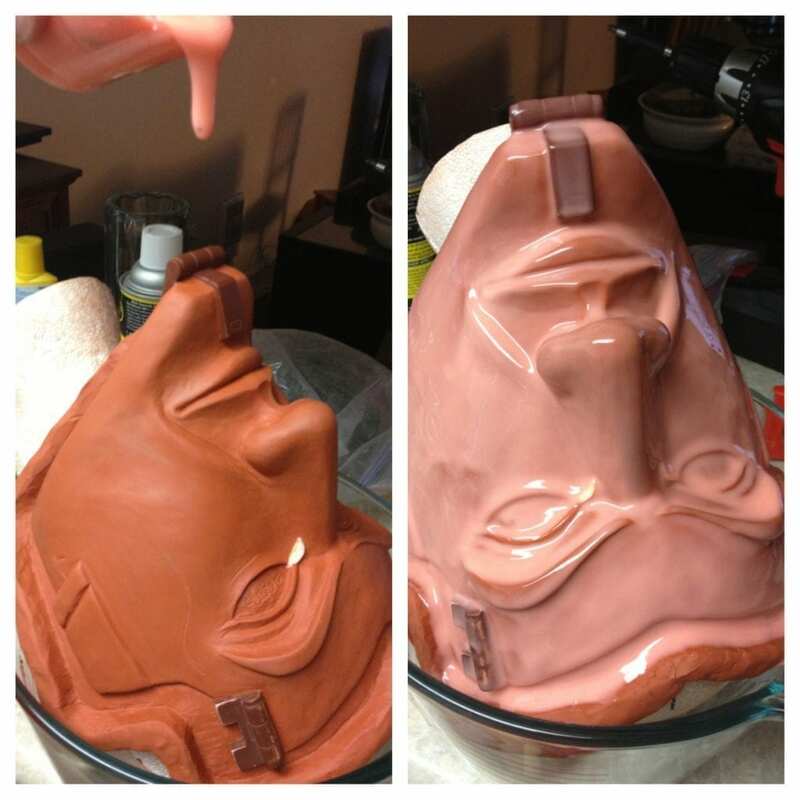 2 layers of Plasti-Paste made up the mold jacket. 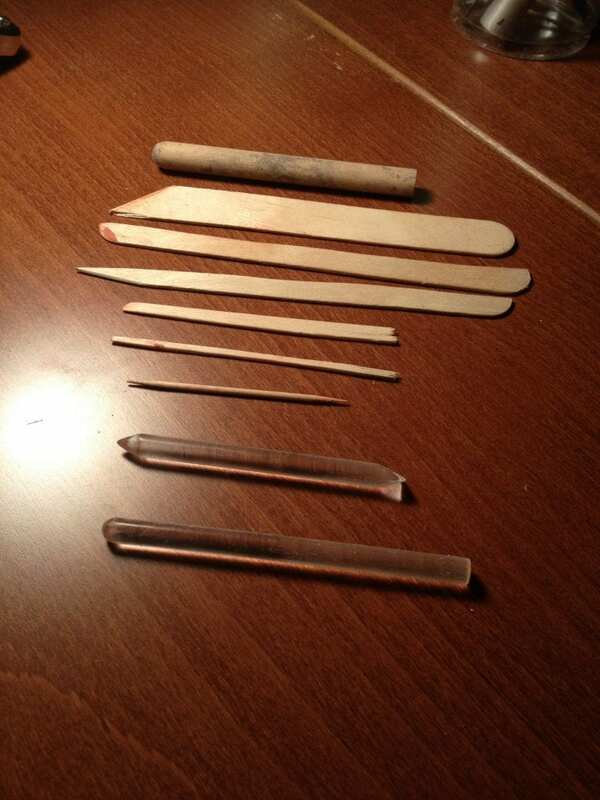 Once all of this was cured, I pulled it all off the master. 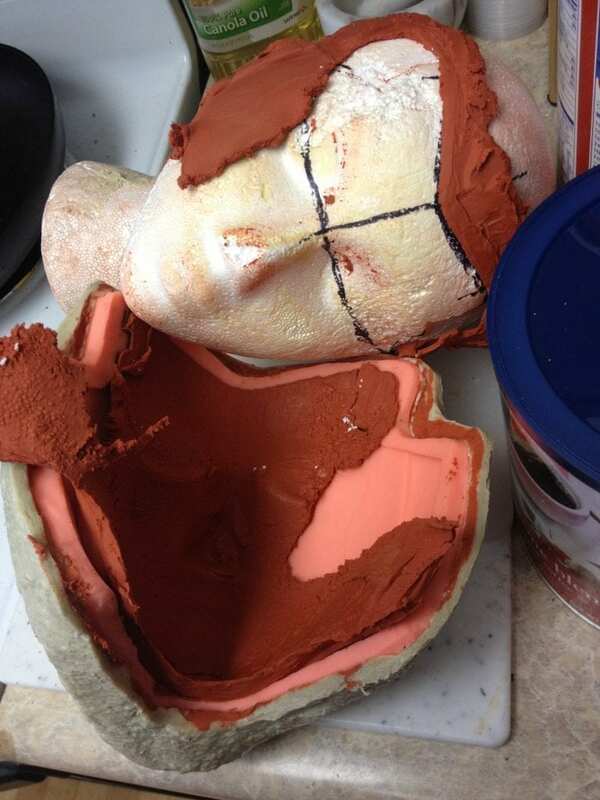 The clay came off with the silicone, destroying the master. 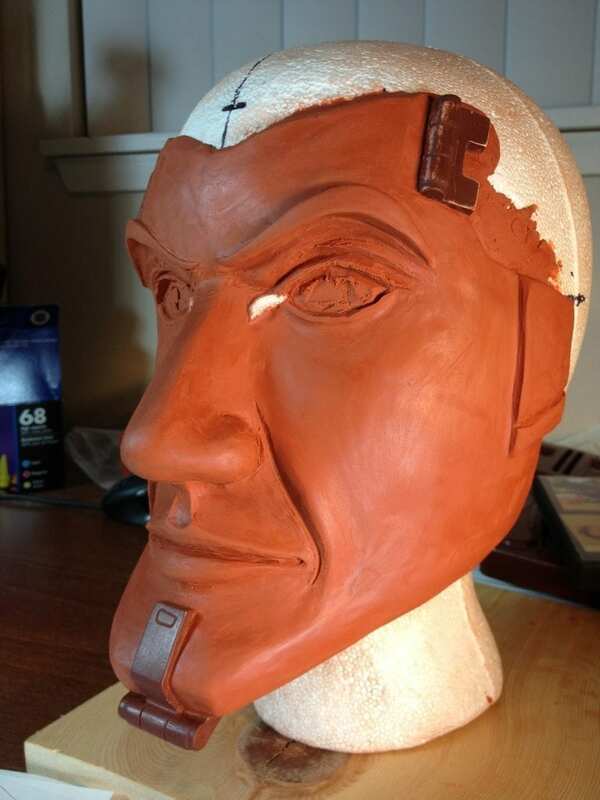 Let’s hope the mold works, or a week of sculpting will have just gone right out the window! 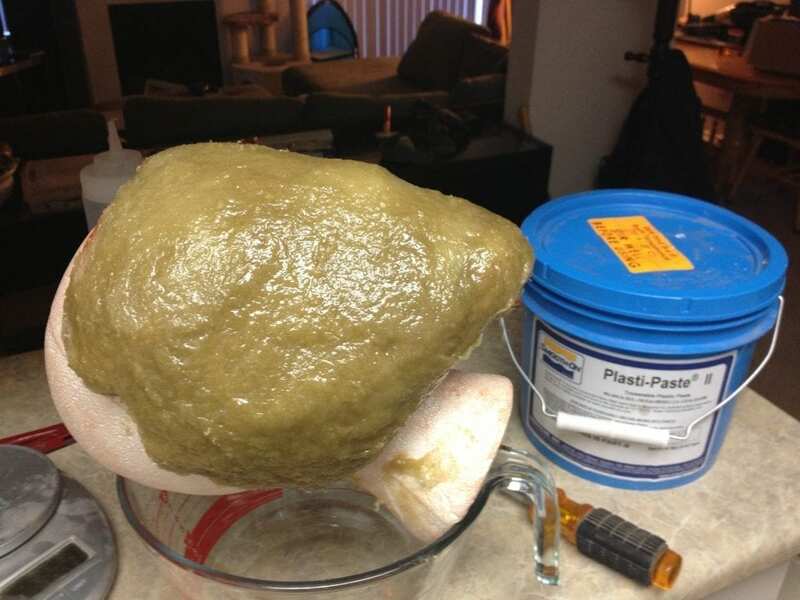 The copies were slush cast with polyurethane plastic resin. Pictured here is Tap Plastic’s Quik Cast, but I ended up using Smooth-On’s Smooth-Cast 300. 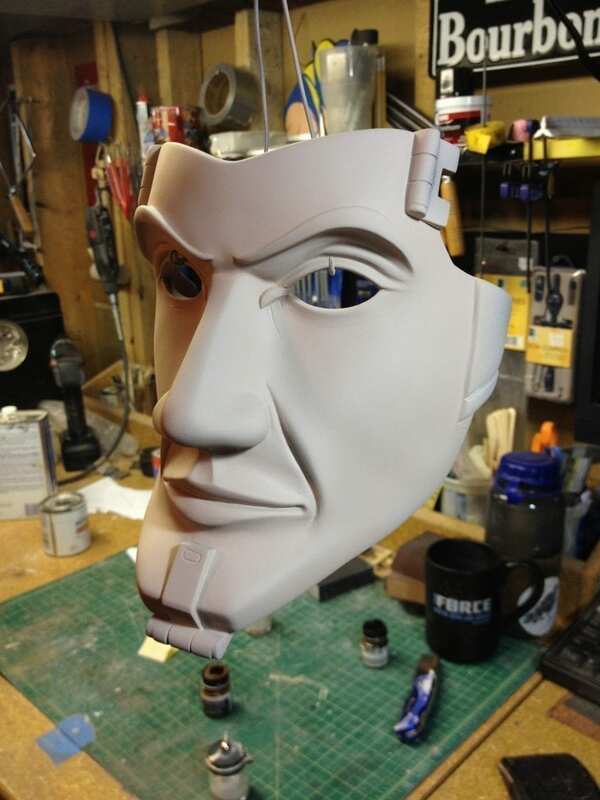 For a comprehensive tutorial on slush casting, check out Volpin Props’ video here. 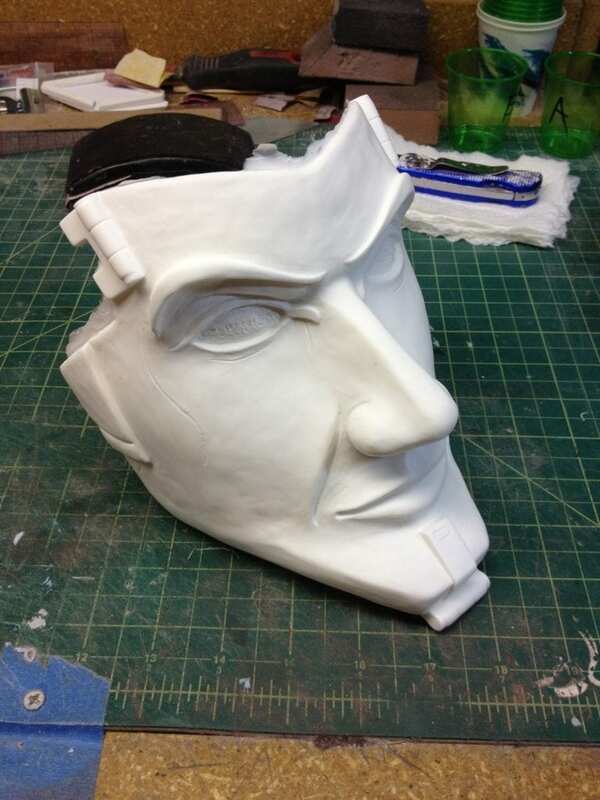 Out of the mold, the mask looks pretty decent, but needs a lot of sanding. 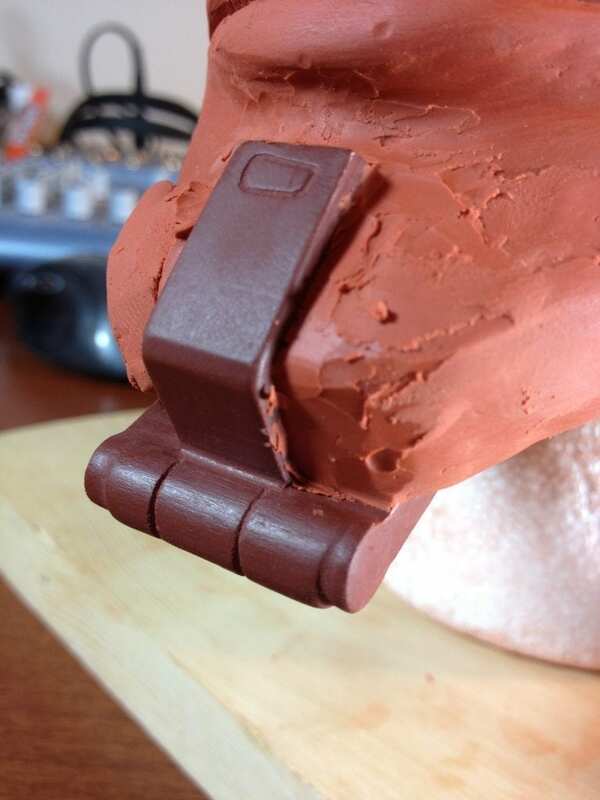 I had a lot of trouble getting the master to be perfectly smooth since you can’t sand clay. Post sanding, this handsome fellow was ready for a little paint. The base coat was some light, flesh colored enamels that I applied with my airbrush. I also went over the face again with a slightly darker skin tone to give it a little depth. The hair and metal bits were also enamels that I just brushed on. I outlined his face, as per the game art style, with permanent marker. Finally, the client asked that I add removable eyes for display purposes. So here is our cheeky hero, complete with peepers!